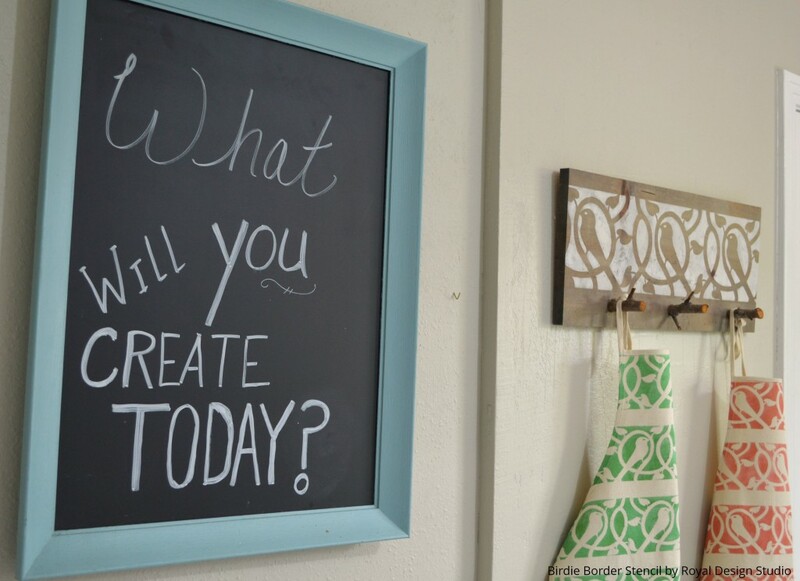 We are so pleased to introduce a new contributor to Paint + Pattern. 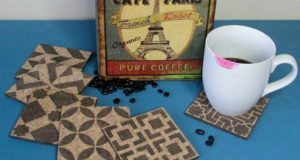 Wendi Wachtel of H20 Bungalow Blog joins us as a monthly DIY project contributor with a great stencil project that is a pretty as it is versatile! Take it away Wendi!!! 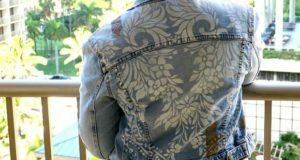 Last fall I started noticing how many of my good shirts had transitioned over to my paint and project wear pile. I’m a fairly neat painter, but the odds are not in my favor simply because I paint a lot. I don’t always plan my paint time, sometimes I just grab a brush and start because the motivation or thought is fresh in my mind and I rarely stop to change clothes. My solution? I now wear aprons for painting and messy projects. It works! I can’t think of a single shirt that has joined the ranks of “painting clothes” for the past few months. Now that I’ve found a solution to my shirt dilemma, I thought I’d add a little style to my apron wear with some colorful stenciled aprons featuring a fun, stylized bird motif. 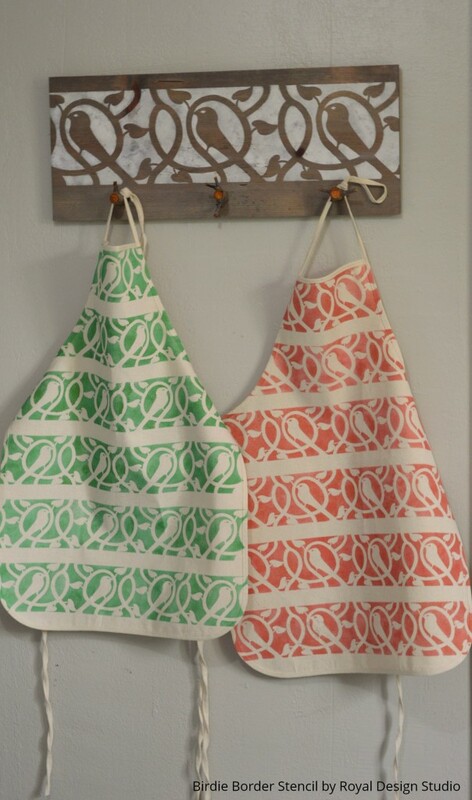 I even made a custom matching stenciled rack to give my stenciled aprons a fun place to hang out! 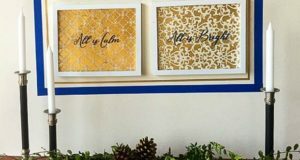 Read below to see how to use the Royal Design Studio Birdie Border stencils to create this fun spring project. Step 2: Begin by positioning the stencil along the top of the apron. 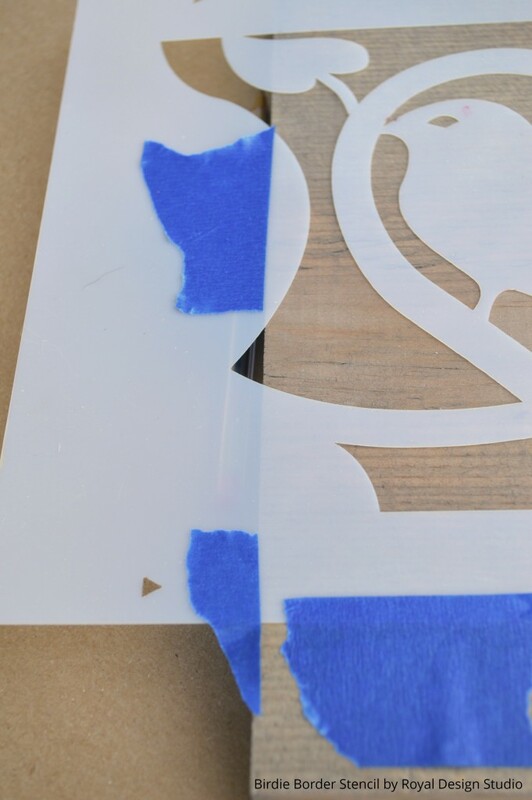 Use painters tape to hold the stencil in place. Step 3: Load just the tips of the bristles and offload excess paint onto paper towels so that you are working with a fairly dry brush. 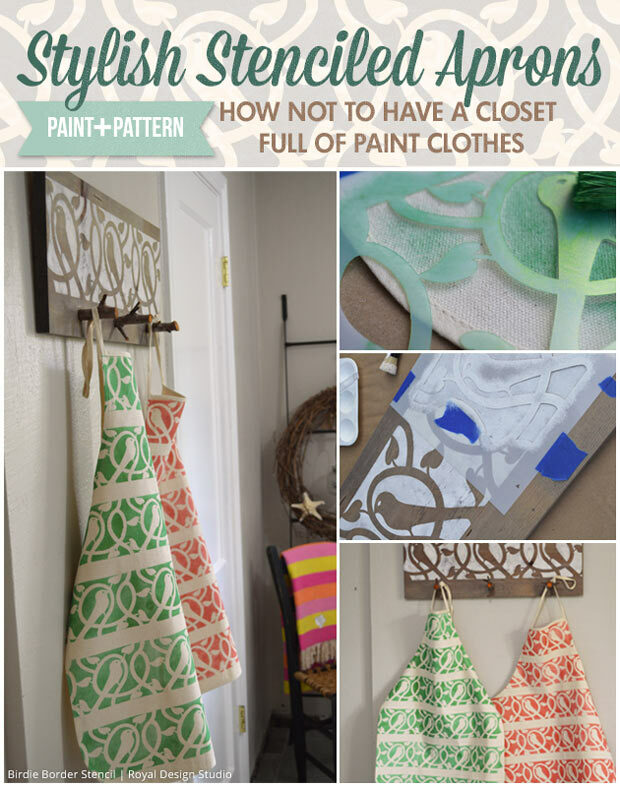 Swirl or pounce the paint onto the fabric through the stencil. You’ll get best results with a brush that’s almost dry. To get a darker color, continue to apply thin layers of paint with the stencil brush. Step 4: To create an allover pattern that runs down the stenciled apron, reposition the stencil just below the first row and secure it in place again with the painter’s tape. Stencil each row and move the stencil down to begin another row until you reach the bottom of the apron. Note/Quote: You may want to measure the total length of your apron and your border width to preplan the layout of your border stencils. Step 5: Allow the birdie aprons to dry and follow the fabric medium directions for setting the paint. 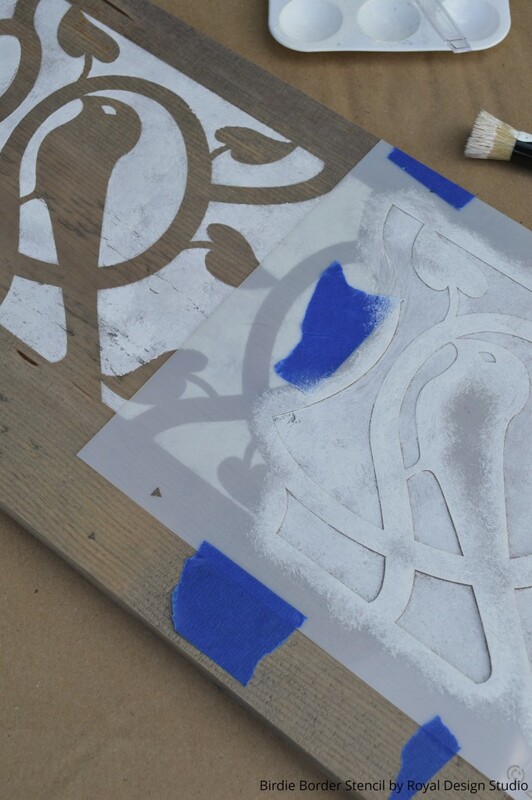 Step 1: To fit three birds on a 24” board, you‘ll need to begin the birdy pattern 2 1/4″ from the left edge of the stencil. 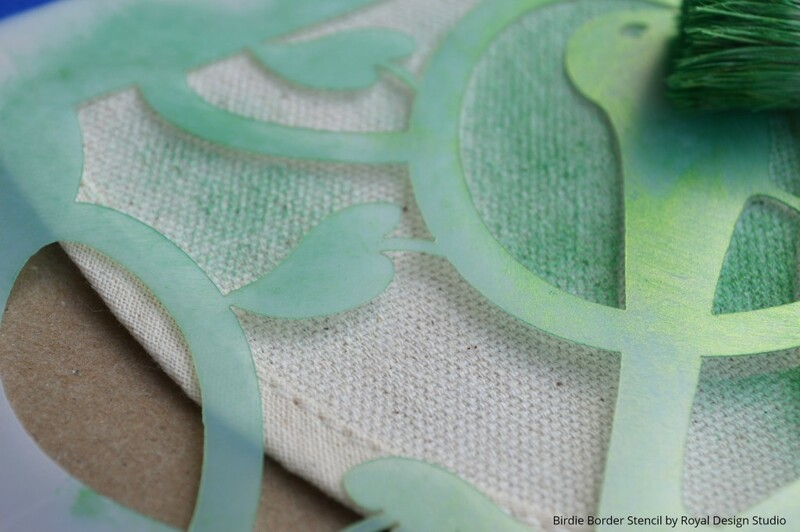 Use painter’s tape to mark the start of the birdie pattern and secure the stencil to the board. 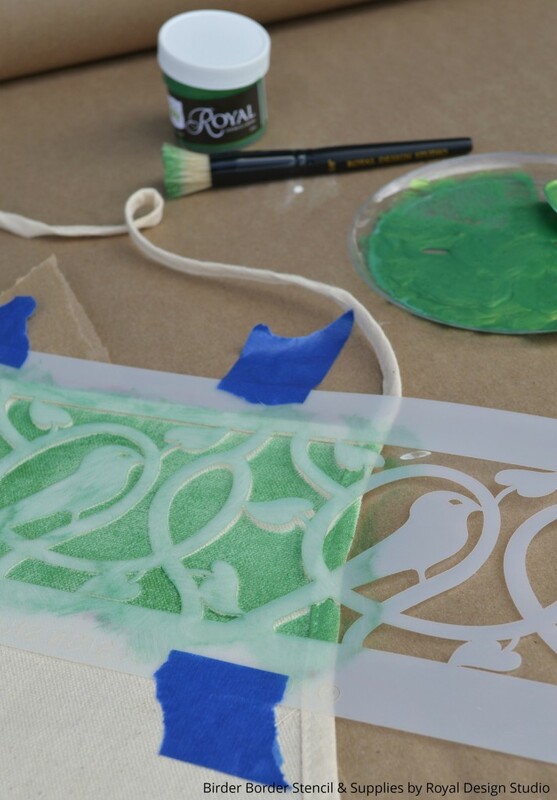 Step 2: Begin stenciling with your paint. Dab only a little paint onto the brush tip, offload excess, and pounce the paint through the stencil, on to the board. Repositioning the stencil for the next section is easy by lining up the built in registration marks on the stencil. 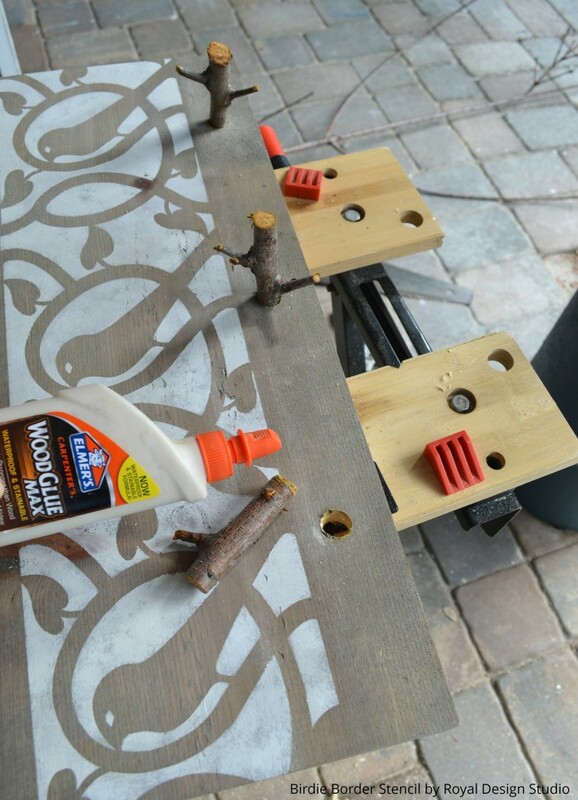 Step 3: Add the hanging hardware to the back of the board before mounting your hooks or branch pieces. If you’re using branches, drill three holes in your board. My branch pieces fit the holes snugly and I tapped them into the holes gently with a hammer. Add a little wood glue to help secure them in place. Thinking outside of the box is always fun. The birdy border apron and apron rack are a few examples of creative ways to use border stencils beyond just stenciling a border pattern around a room. 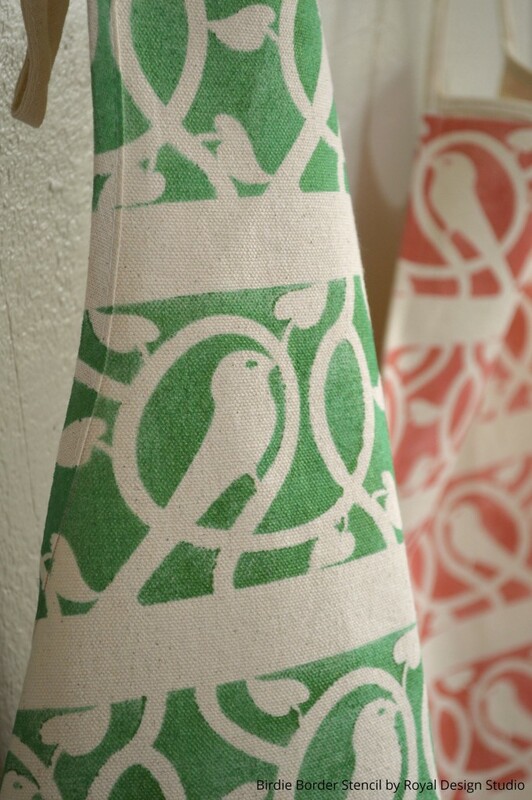 These Birdie border stenciled aprons and apron holder are a fresh and stylish way to protect clothes and add a little spring cheer with color. They’d look great and be functional in many settings like a studio, a kitchen, or even a potting shed for someone who loves gardening. 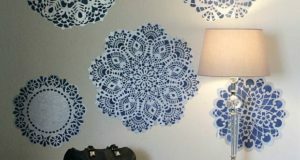 Royal Design Studio has a whole series of great Border Stencil Patterns. What creative ideas could YOU think of for using them?? Thanks Regina! I love the twigs for hooks too. I searched for hooks with character for the longest time and happened to be looking outside my office window one day, … next think I knew I had a handsaw and was cutting branches! I think they do the birdie stencil justice! Love the birdie stencil you used on these pieces. Your aprons are so pretty and when not being worn look so pretty hanging in your space. The the tree branch apron holder too – such a creative use of twigs! You made some nice points there. I did a search on the subject matterand found nearly all persons will consent with your blog.